Mfr Part: MGWSP1000 Main Sight Tool - Now comes with the 30 degree pusher block for Glock and HK sights. A must have for Gunsmiths and Armorers. The Sight Pro uses a unique clamping shoe design, plus 4 slide support pads and a white nylon spacer block to lock the slide in place while adjusting or replacing sights. Two cuts on the lower section of the tool allow you to lock it in a bench vise. Redesigned to make it easier to swap out the pusher blocks. Shoes do not come with Sight Tool. Slide Shoe - Unique clamping shoes are firearm specific. These work with the MGW Sight Pro. 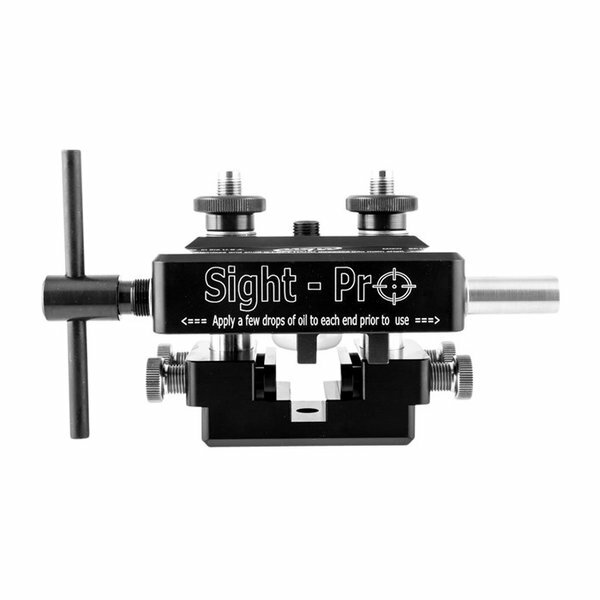 Main Sight Tool - Now comes with the 30 degree pusher block for Glock and HK sights. A must have for Gunsmiths and Armorers. The Sight Pro uses a unique clamping shoe design, plus 4 slide support pads and a white nylon spacer block to lock the slide in place while adjusting or replacing sights. Two cuts on the lower section of the tool allow you to lock it in a bench vise. Redesigned to make it easier to swap out the pusher blocks. Shoes do not come with Sight Tool. Slide Shoe - Unique clamping shoes are firearm specific. These work with the MGW Sight Pro.